This entry was posted in St. Louis Cardinals, United Cardinal Bloggers and tagged Allen Craig, Carlos Beltran, Matt Adams, Oscar Taveras, St. Louis Cardinals by stlcupofjoe. Bookmark the permalink. 2. His post season stats are blown way out of proportion. He put up good numbers for us last postseason in games we won as blowouts. What about his 0 rbi in last 6 of nlcs…What about fact that when Houston saw him strike out against waino they let him go and then went to world series next year… what about the giants winning the world series, then getting beltran and not making playoffs, then dumping him and winning world series…What about us winning world series, getting beltran only to have him give us no rbi in last 6 nlcs games and costing us back to back world championships..
3. We win when he doesn’t play – 21 and 6 last two years when he doesn’t play!!!!! 5. He completely blows during late inning pressure situations ba of .220- just awful !!! I would rather have adams at first and craig in right and trade Oscar for a shortstop, if they are to trade. But I believe they should stay pat. Outfield of holiday, jay, craig with robinson as 4th. Infield of adams, carp, Koz, freese with wong and DD on bench. Yadi and Cruz catching…that is a world series championship team right there. Its kind of funny how for three years everyone says that Jay will be a 4th outfielder. He is our centerfielder for the next 5 plus years. Oscar, if he makes the majors as a Cardinal with play right or left. Jay is a great centerfielder, a great hitter and helps the Cardinals win all the time. Jay is the anti Beltran. Jay hits with runners on and not so good without runners on. .315 vs .232..Kills it in late inning pressure situations .381 in late inning pressure situations with runners on… .381!!!!!!!!! Jay also among lead leaders in sac bunts, hbp, walks has higher obp than beltran and drives in more runners already on base than beltran. Even in your idea of Jay, Holiday, Beltran, Oscar – Beltran should be the 4th outfielder and that is too high a price for a 4th outfielder. With everything I said being facts- not opinions- it makes zero since for us to resign Beltran. I knew you would be the one to comment. First off, thank you again for reading. Though what you may say are facts, you are missing something. 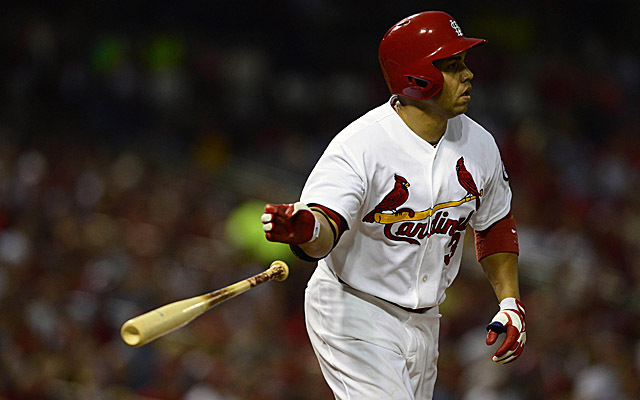 Carlos Beltran is NOT on the Cardinals to do some of the things that you listed. He is on the team to hit for power and drive in runs. He is not on the team to sac bunt, break up double plays, steal bases (although, he does only have 2 less stolen bases than Jay this year). Yes, his defense is down this year, but he more than makes up for it with his bat. You also cannot discredit him for his performance at the end of the NLCS last season. The ENTIRE offense flopped at the end of the Giants season. One win away from the World Series, and the offense just could not come through. There are 9 players in a lineup, cannot blame that solely on Beltran. Also, your statement saying that Beltran was on Houston when Wainwright struck him out is also 100% false. He was on the New York Mets at that time, and he stayed with the Mets for another 5 seasons after that. I am sorry, but that is just a fact. Beltran is an incredible player, a perennial All-Star, a future Hall of Famer, a leader in the clubhouse, and MOST IMPORTANTLY a GREAT guy in the community. The fact that you are unable to see that through all those stats that you listed scares me. Oscar Taveras is the #1 prospect in baseball. They will not be trading him for a shortstop unless another Derek Jeter-like player is found somewhere. Lastly, if you read into my post further, my lineup listed Jay first in the CF position. That is because I think it is JAY’s spot to lose next season. I just wrote a post about how great Jay has been in the second half this season. He is a career .300 hitter and does all the stuff that you mentioned above. Beltran’s standing on the team really does not affect Jay at this point, largely because Taveras is projected as a right fielder long-term. Maybe he will get to play some in center field, but that is not where he will play long-term, especially with his ankle injury. P.S. I also do not see Freese on the team next year like you said in your comment, but that is another argument for another day.